Dann Huff. Photo: Cameron Powell. Dann Huff made his third appearance on The Producer’s Chair, at the 9th Anniversary Show on Thursday, Aug. 27, 2015 at Douglas Corner at 6 p.m. According to renowned producer Dann Huff, we are now officially in a singles market, which may account for the number of clients on his plate. Talk about a balancing act for the man named Billboard’s Country Producer of the Decade and last year’s ACM Producer of the Year. The single was recorded with Steven’s back-up band Loving Mary at John McBride’s Blackbird Studios in Berry Hill. 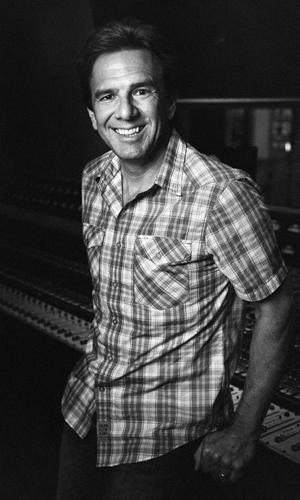 Looking back, Huff’s move into production following his remarkable body of session work, was the result of friendly persuasion by Mutt Lange, who told Huff, “You are a producer in guitarist’s clothes.” As a session musician, Huff worked with Barbra Streisand, Kenny Loggins, Reba McEntire, Celine Dion, DC Talk, Shania Twain, Michael Bolton, Luther Vandross, Peter Cetera, Donna Summer, Rod Stewart, Michael Jackson, Madonna, Whitney Houston, Amy Grant, Fine Young Cannibals, Barry Manilow, The Temptations, Chaka Khan, O’Jays, Smokey Robinson, Clint Black, Faith Hill, Tim McGraw, Natalie Cole, Gladys Knight, Neville Brothers, Dusty Springfield, Rick Springfield, Olivia Newton-John, Toby Keith, Billy Joel, Joe Cocker, Bryan Ferry, Peter Wolf, Martina McBride, Chicago, Wynonna, Glen Campbell, Paula Abdul, Tammy Wynette, Mariah Carey, Merle Haggard, Bob Seger, Boz Scaggs, and countless others. Although flattered, Huff really didn’t know how to begin as a producer, until Lange recommended him to Faith Hill. Then came two Megadeth albums, as well as work with country newcomers Lonestar and SHeDAISY, who went on to become award-winning, multi-platinum acts. As their careers took off, so did Huff’s. Some of Huff’s other cherished awards include a total of nine ACM trophies, two MusicRow Producer of the Year honors, and multiple CMA Awards, not to mention a boat-load of nominations. But don’t be surprised if Steven Tyler is only one of a long list of iconic artists from other genres, who would love to have Huff helm their country project. The Producer’s Chair: Can you describe your sessions with Steven Tyler? Dann Huff: Steven has the enthusiasm of a first-time artist, but he maintains a balance between being very demanding on himself and, by proximity, on everybody. He elevates a room, and yet he’s also one of those people who is thankful and grateful and expresses it. He doesn’t take things for granted, and that’s something that only age really burns into you or zaps out of you. All in all, Steven is such a refreshing person. He’s one of those people who you want to be around. There‘s a real buzz around Thomas Rhett. How did you and Jesse Fraser wind up co-producing? Thomas’s manager Virginia Davis called me. Jesse is a phenomenal songwriter/ programmer/ track guy who also runs Major Bob Publishing. He’s one of my favorite producers. I asked Thomas, “Why me?” He basically said, “To balance both worlds.” Because the new crop of artists making records grew up with hip-hop, so their values are very hip-hop and pop infused. Jesse is a realsecond generation country writer, so it’s been fun and I really enjoyed the experience of co-producing with him. I learned as much as I gave. Are most of today’s new artists bringing hip-hop/rap influences to their music? Yes. Even Brantley Gilbert, who is a deep Georgia country boy, listens to old country and loves it. But the last time he was up here he was playing me Lil Jon, and not for shock value. He listens to George Jones and as far as you can reach into hip-hop. Do you suspect that Nashville’s producers will be doing a lot more co-producing in the future? To me, you’ve got two choices: rest on your laurels or stay hungry and immerse yourself and learn. Reinvention has to be integrated at all times. It’s constantly morphing and changing. That’s what I’m enjoying right now. Where do you record most of your projects these days? I track in a proper studio, but I also do a lot of it at home. Mostly I do vocals and overdubs at home, where I have more time and less money going out of the budget. The sad thing about that is who that affects [the proper studios]. The pie has gotten so much smaller, and everyone is trying to find ways to save money. If I have my choice of paying for a studio, it’s John McBride’s studio Blackbird. He has one of the best studios in North America. And I’d love to go over there and work all the time, but when it’s between hiring more studio musicians or paying for the studio, I have to go with the music. It’s part of our new economy. It’s not all horrible, but it’s not all great. At the end of the day, I just have to get the job done. When you are working with an artist like Jennifer Nettles and there is a decent budget, is Justin Niebank still your engineer/mixer of choice? I use Niebank on 95 percent of what I produce, but I also use Steve Marcantonio, Drew Bollman, Joe Baldridge, Seth Morton, and Mark Hagen to engineer and record. In the same way directors don’t cast the same actors in every one of their films, you have to cast per artist so that you’re not making the same record. We all only have so many ideas. So we switch it up. However, Justin is one of those rare talents that can reinvent himself from project to project. It’s like you’re buying a known quantity with him. He’s also one of my best friends. So, that’s a bonus. What’s the inside-track on Jennifer Nettles’ new album? Talk about a talent, everything Jennifer writes is about her life, which is an artist’s job in my opinion. She’s also one of the best singers. She’s like Reba. She comes in so prepared. No auto-tune needed! She just does it. In our last interview you said, “Iconic artists have a story that no one else can tell, as young artists have their own story. And the story that an artist brings to the table is inevitably where the songs come from. There’s the interest level right there for fans.” Do you think that mainstream radio is providing that for fans, lyrically? No, but then again, that’s not what it exists to do. Mainstream radio is there to provide entertainment for listeners and to hopefully keep them listening long enough to hear the advertisements! Is there a reason why women aren’t getting equal airtime? It’s always a cycle. When I first started producing records women pretty much controlled the airwaves! If you wait long enough it will happen again. There are a lot of very talented female artists making music right now. More artists than ever before are having success, without mainstream radio. What has changed? Those artists are touring and finding new ways via social media to get their music out there. Management and labels are getting creative in finding new ways to access a wider audience. They know there are a lot more fans out there who are scouring the Internet for new music, not even interested in the Top 20 scenario. Like my son. If it’s on the radio, it definitely won’t be on his playlist! Why do some artists receive a stronger commitment from the label than others, coming out of the box? Very simple—the labels have to pay bills like everyone else, not to mention their stock holders. Whichever artist is having the hits at the moment accomplishes this, and also pays to find and establish the artists of tomorrow. It’s not a perfect science and many times some great music is missed, but at the end of the day, it is a business. Whose music do you listen to, at the end of the day? I’m a product of the 70s, so I default to that! Aural comfort food. But seriously, I listen to everything on the radio, and I love recommendations, especially from my kids. I like to know what’s happening outside of Nashville, but I also am very keen to stay abreast of what’s going on right here in town. I love what Jay Joyce has been doing. What are the biggest challenges facing our industry today? And what are some solutions? GETTING PAID! This affects everyone in the service sector: writers, publishers, musicians, producers, record labels, management, etc. We are all dependent on one another. The technology that serves us so well has also marginalized our product. Free is tough to compete with. We’ve got to compromise. The good ole days are gone. If we let greed guide us, we’ve got problems. We still get paid good money to do something that we love, but that doesn’t mean we shouldn’t try to make it better. We have to learn how to redistribute revenue streams available to us in order to pay everyone. On the production front alone, my friend Joey Moi is involved with Craig Wiseman’s label. I think he has struck a great balance there. He has a great incentive to further the career of his artists because of the revenue streams available to compensate him. Perhaps the wave of the future is that all producers will become staff producers, very much akin to the 1960s. There …we just solved everything.